We often hear about the importance of recycling, but do we actually realize its impact? Recycling is one of the three R’s of waste management: Reduce, Reuse, and Recycle. Recycling is the process by which discarded materials are collected, sorted, processed and converted into raw materials for the production of new products. For instance, newspapers can be used to make new newspapers, or glass jars can be used to make new glass jars. Recycling plays a tremendous role in not only preserving our environment but also in bolstering our economy. While some would argue that it’s easier to just toss out garbage, doing so only adds to our ever-growing, overflowing landfill problem. Granted, recycling takes a little effort, but consider the big impact recycling makes like saving energy, conserving natural resources, reducing pollution, counteracting global warming, and creating jobs. Besides, why throw away something that can be used to create something new and useful? So while “going green” has become the trend these days, at Parkersburg Waste & Recycling, we believe it is more than a passing fad or popular catch phrase. Recycling is about adopting a responsible way of life that allows us to be part of the solution, rather than the problem. 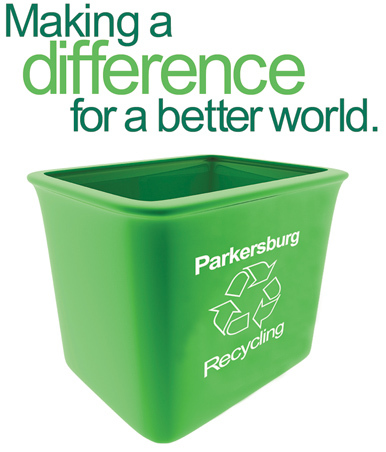 The recycling process used by Parkersburg Waste & Recycling is a dual stream system. Residents are asked to use two recycle bins: one for all paper, including corrugated cardboard; and the other for all glass, metal and plastic containers. This system lowers the probability of processing contaminated material. Clean, uncontaminated material is more desirable by manufacturers, and thus has more value. The labor costs for sorting material in a dual stream system are lower, making the overall system more efficient and cost effective.